Tired of Bake Sales, Chinese Auctions and Car Washes to raise money for your Non-Profit Organization, Boy Scout Troop, PTA or Little League Team? The Long Island Ducks Group Sales Department would like you to sit back and take advantage of our discounted group tickets for your next fundraiser. Discounted group tickets can be reserved by your organization and sold to members of your community, friends, family and neighbors with an additional donation going directly to your groups cause. Reserve our $12 tickets at the group rate of $11 and sell them for a price that works for your group. Your group will only pay for the number of tickets it sells and the end result is a fun-filled group night to the ballpark and some extra profit for your cause. Step 1: Pick out a few home games that will work for your fundraiser and talk to some group members to determine how many tickets you feel comfortable starting with. 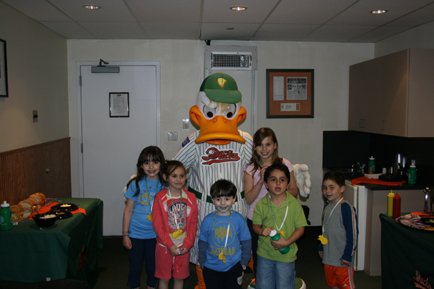 Step 2: Call the Ducks Group Sales Department at 631-940-3825 to discuss availability on those dates. Step 3: Reserve your tickets and provide us with your contact information NO DEPOSIT REQUIRED! Step 4: START SELLING! The Ducks can provide you with posters, flyers and sign up sheets that can help you spread the word. Step 5: Payment is due four weeks before your game date. You only pay for the number of tickets you sell! If you reserved 100 tickets and only sold 89 you only pay for 89! Step 6: Tickets will be printed three weeks before the game leaving you plenty of time to distribute them. Step 7: Enjoy the game with your group and put your groups profit to good use within your organization. The leaders got together and selected a date in June to host their family fun night/ fundraising event for the 250 kids involved with their group. In this instance we are talking about a little league. They reserved 1,500 tickets at the price of $11 per ticket and are selling them for $12 each ($1 profit per ticket). The coaches then made each child responsible for selling 6 tickets to this event. The kids are going out and selling their six tickets to their family, friends, and neighbors. The kids will probably be able to sell more than six tickets each. If they all sell the minimum six tickets, this will result in $1,500 towards their cause (in this case, better equipment for the league). 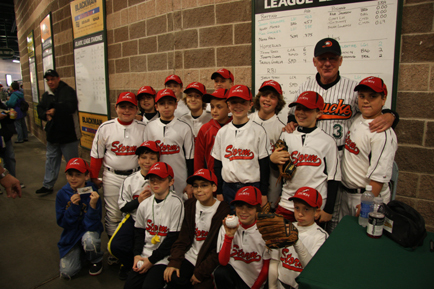 An event which the only requirement is to have a good time at the park and cheer on the LI Ducks will result in $1,500. This same logic can easily be applied for school PTA’s, school sports teams, non-profits, charities, etc. It works for smaller groups also!